The Unicorn HAT is described as "providing a wash of controllable colour that is ideal for mood-lighting, 8x8 pixel art, persistence of vision effects, status indications, or just blasting colour into your surroundings." Recently mine arrived and it is awesome. 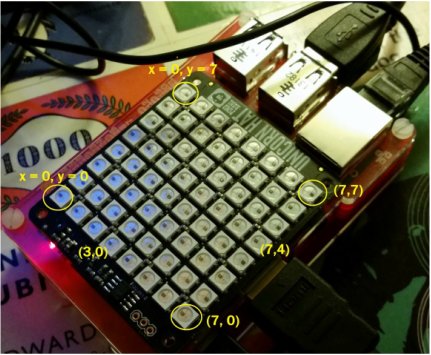 It is also a great teaching tool for learning about Pixels, RGB values and Hexadecimal values combining in how a group of LEDs can make a picture, be it a very bright one! There are 64 LEDs arranged on an 8 by 8 grid, each LED can be identified by its X and Y co-ordinate. 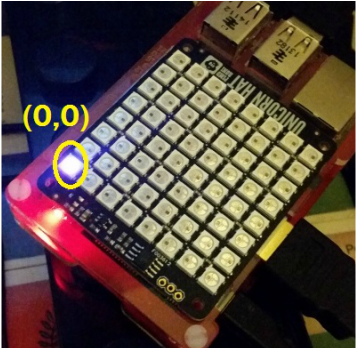 Remember that the first LED is actually located at 0, 0 not 1,1. See picture one on the right for more examples. The code to get started is very simple and there are a number of sample programs on the Pimorni GitHub repository. UH.set_pixel(x, y, 0, 0, 0) where the x and y are the co-ordinates of the LED, for example, the first pixel on the top left would be coded as: UH.set_pixel(0, 0, 0, 0, 0) See the second image below. The last three numbers relate to the RGB colours, 256 is the highest value, so (256, 0, 0) would display a Red LED and (0, 0256 0) would display Green.